The easiest way of getting an abortion is when you can accomplish an abortion effortlessly. When you get an abortion effortlessly means you do not have to go through the problems that occur during an abortion. Whenever you undergo an abortion with the abortion pills you are inducing your body to give you a natural abortion. This abortion brings in a few intended side-effects like bleeding, cramps, fever, vomiting, and nausea. We welcome bleeding and cramps as part of the abortion success but we also fear if it is aggravated. To control over this fear you can buy abortion pill pack that allows alleviating any such side-effects which become a pain for you. What are the contains of abortion pill pack?? This abortion pill pack contains two abortion pills mifepristone and misoprostol, one anti-emetic pill one anti-inflammatory pill and a blood coagulant. Mifepristone- This pack has one pill of mifepristone present in the pill pack which is of 200 mg. This mifepristone pill acts as an inhibitor to the progesterone pill present in this pack thus this is also known as anti-progestin. This pill is the first dose that is supposed to be taken in the sequence of abortion pills. Once the mifepristone blocks the progesterone hormone the pregnancy halts as the fetus gets detached. Misoprostol- this is the second pill present in the sequence which is needed to dilute the entire cervix mucus along with the fetal parts. After these pills are taken the endometrial tissue starts shedding and you will start experiencing cramps as well as vaginal bleeding. There are 4 sets of misoprostol pill that are present in this pack which needs to be taken 24 hours after the mifepristone pills. You can take this pill buccally or sublingually according to your convenience. You can also take two pills at a time with the interval of 3 hours in between both the pills. Ondansetron or Zofran- this is the antiemetic pill that is present in this pack which makes chemical actions in your body so that you do not feel vomiting or nauseous. The single pill is of 4 mg which is required to be taken before you take the misoprostol pills so that you do not vomit the pills out while holding it in your mouth. Flexon-MR- this is the anti-inflammatory pill that controls the body temperature and your cramps. You have to take this pill as soon as you start feeling vaginal cramps normally after ingestion of the misoprostol pills. You need to take the pills when the pain has just started as this works if taken at initial period. If you take it after the pain has become intense then it may not be that effective. Ethamsylate- this is the blood coagulation pill that controls the excessive flow of blood from your body. This is the most loved pill for those women who are suffering from anemia as this pill restricts too much blood flow from the body and so the Iron contained in the body is still maintained. Now, you are aware how this abortion pill pack is useful but along with the systematic dose structure of this abortion pill pack, you need to follow a few steps so that you do not face any further issues. 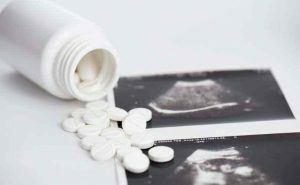 If you are using abortion pills for abortion then you need to take it in the 1st trimester itself as during this time the fetus has not developed at all. Always remove your IUD device to avoid any complications during an abortion.